I contribute footage of a few cakes each month to the Food Network, to share across their social channels. 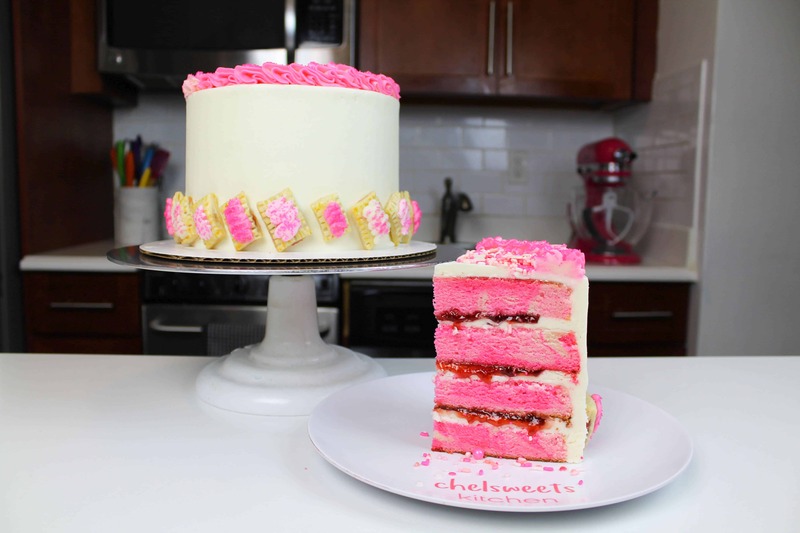 This strawberry Pop-Tart-inspired cake was definitely my favorite one this month, and it was so fun I wanted to share the recipe. The best part of this cake? 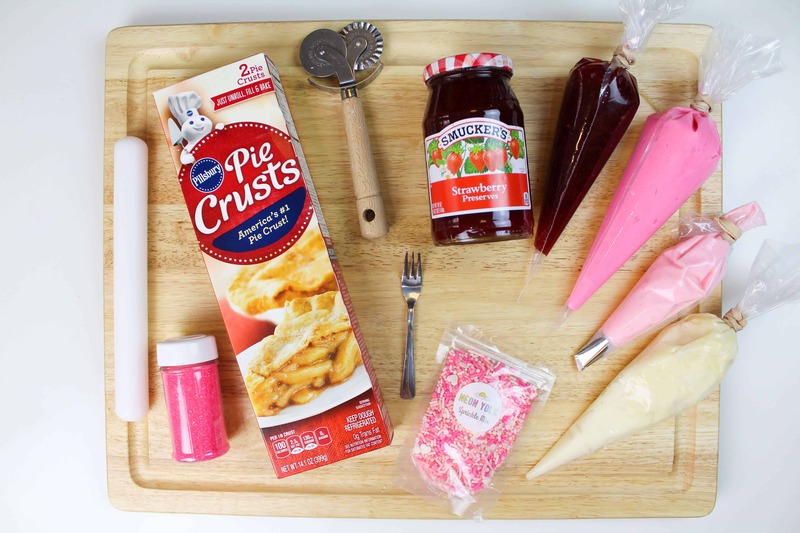 The adorable mini strawberry Pop-Tarts used to decorate the base of the cake. The good news is that they’re just as simple to make as they are cute. They’re made using store bought pie crusts, strawberry jam, an egg wash, and some colorful buttercream and sprinkles. If you wanted to fully make them from scratch, you totally can! But since cakes are already such a labor of love, I like to not get too crazy with the decorations. 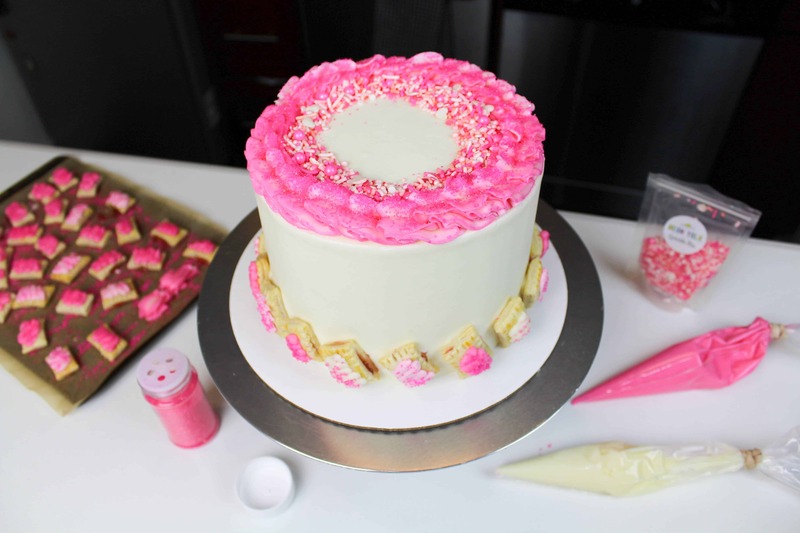 Begin by making the cake layers and buttercream, as directed in the above recipes. The layers will take a bit of time to bake and cool, so I recommend making them first (or even a day in advance). Next, begin to prepare the mini Pop-Tarts. Preheat the oven to 350 degrees Fahrenheit. 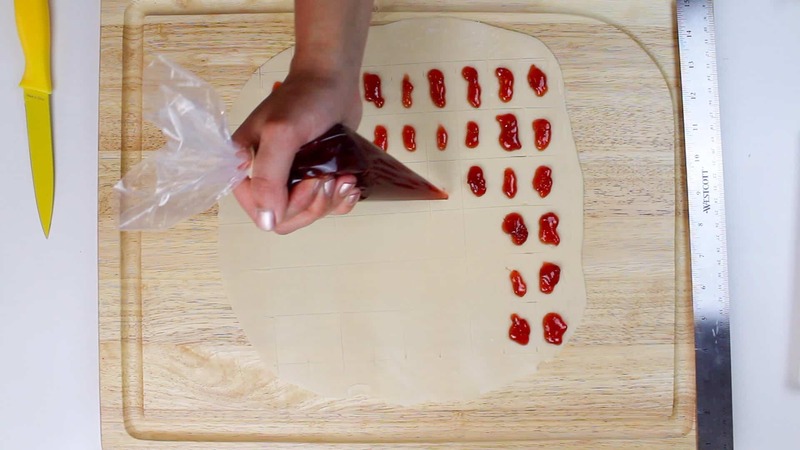 Roll out one of the pie crusts. 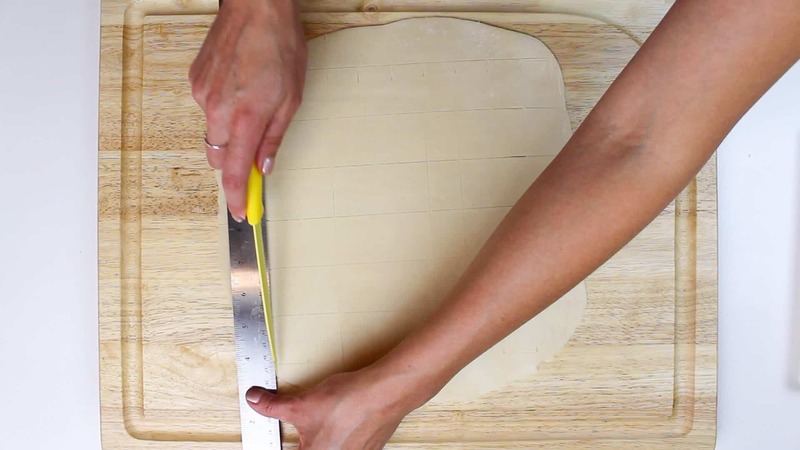 use a ruler and knife to score the dough to create rectangles that are 1 inch by 1.25 inches. Put about 1/2 a cup of strawberry jam into a piping bag, and cut a small opening (less than 1 cm). Carefully pipe a thin line of filling into the center of each rectangle. Next, unroll the second pie crust, and place on top of the jam lined pie crust. Carefully use your ruler to remark the rectangles (you can see the jam through the pie crust, and use it as a guide). 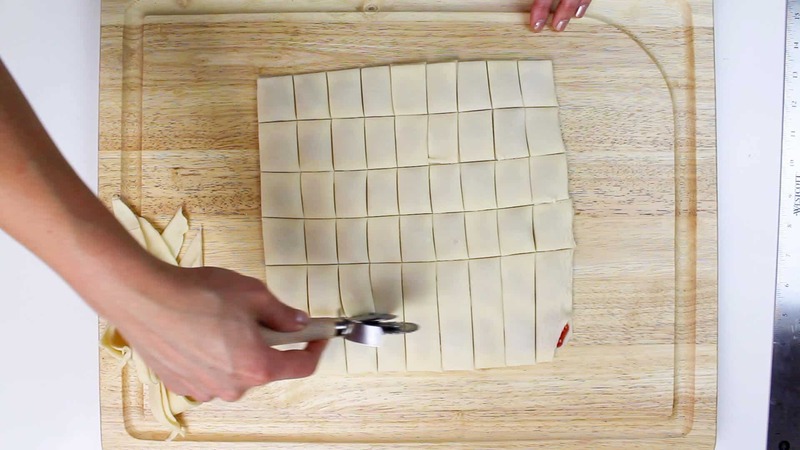 Use a pastry cutter and ruler to cut out the rectangles. Carefully lift each Pop-Tart (the pieces will slide a bit due to the filling), and crimp the sides using a fork. Also poke a few holes on top of each one, to help them rise and allow air to escape as they bake. I had a mini fork on hand (long story, but it’s from making little mermaid cupcakes ages ago…), which worked perfectly for this! if you don’t have one, use the smallest fork you have. 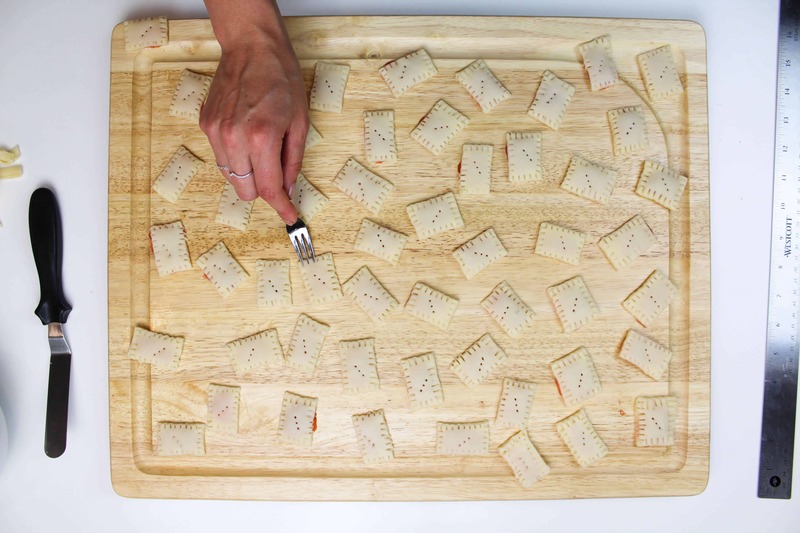 Transfer the Pop-Tarts onto a parchment paper lined baking sheet. 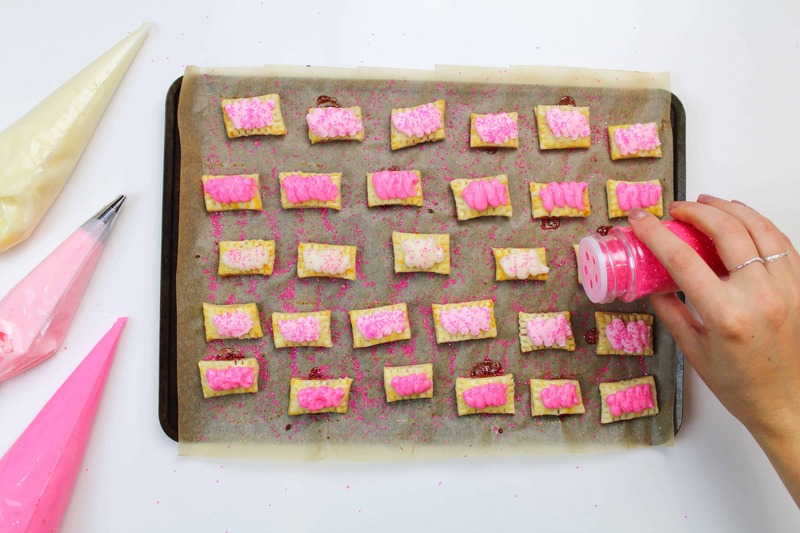 Beat together one egg and 1 tbsp of milk, and use a pastry brush to paint a thin layer of egg wash onto each Pop-Tart. Bake in the oven for 15-17 minutes, or until golden brown. I was convinced these would bake up much fast, but it took some time for them to become golden brown, and baked through. 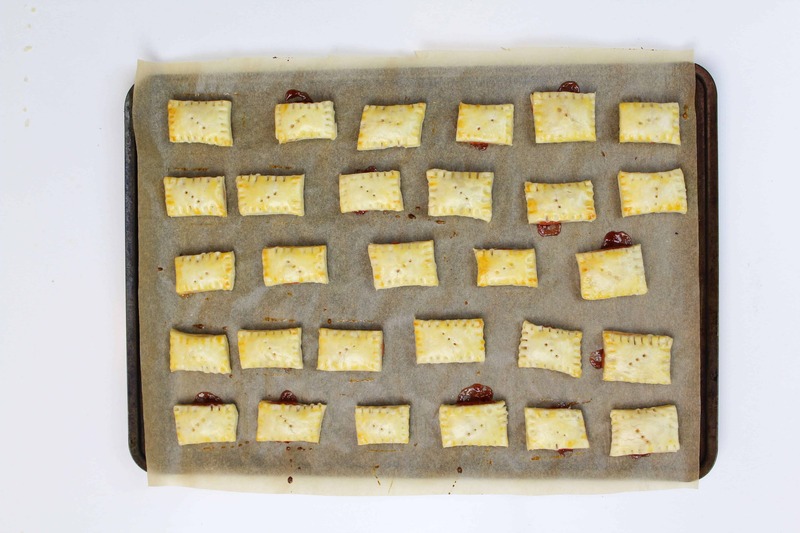 Slide the parchment paper onto a cooling rack, and allow the Pop-Tarts to cool (at least 30 minutes). Once they fully cooled, pipe buttercream onto each Pop-Tart, and top with sprinkles of your choice. I colored a tiny but of my buttercream light and hot pink, and piped the different colors onto my Pop-Tarts. I also chose to use hot pink sanding sugar as my sprinkles. Once the Pop-tarts are ready, it’s time to assemble the cake. Smooth a thin layer of buttercream on top of each layer. Pipe a ring of vanilla buttercream around the edge of the layer to create a frosting dam, then spread a layer of strawberry jam inside the vanilla frosting. Repeat this process with all remaining cake layers. 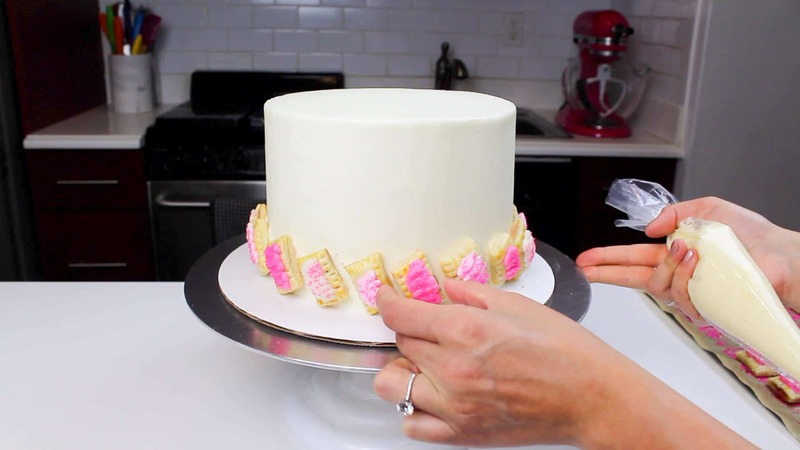 Cover the cake in a thin layer of vanilla frosting (crumb coat) to trap any run-away crumbs. Chill the cake in the freezer or fridge for about 5 minutes, until the buttercream is firm to the touch. Pipe a bit of buttercream onto the back of each Pop-tart, then gently press it against the base of the cake. Repeat this process, alternating the colored Pop-Tarts, until the entire base is covered. 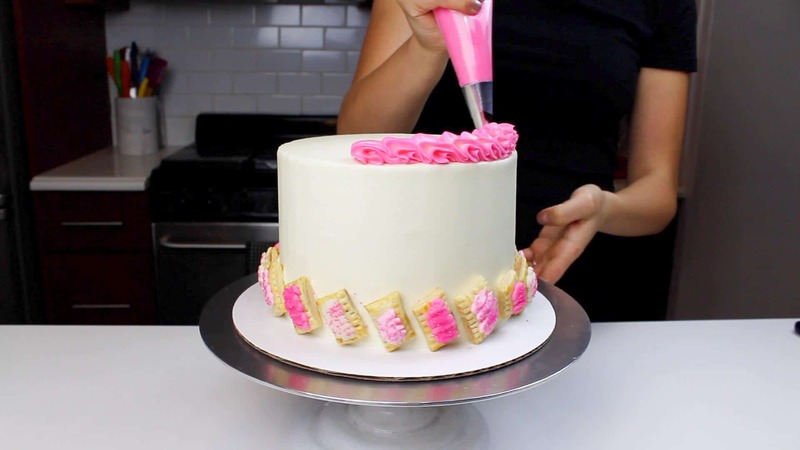 Color the remaining buttercream pink using gel food coloring, and pipe a boarder around the top of the cake using your favorite frosting tip (I used a Wilton 1M). 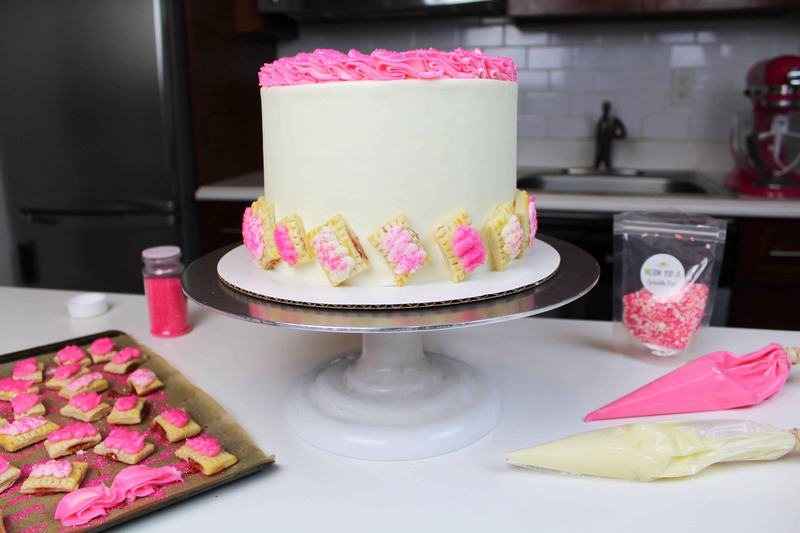 If desired, add a pink sprinkle blend to the top of the cake, around the boarder. I love using Neon Yolk sprinkle blends! They make the cutest blends, and use them on my cakes whenever I can. Then it’s time to cut into the cake and try it! I am a sucker for anything with strawberry jam, so I loved this cake. I also could not stop eating the leftover Pop-Tarts! They were addicting. Hello – I’m unable to find your black buttercream recipe. Can you please email to me. Thank you! 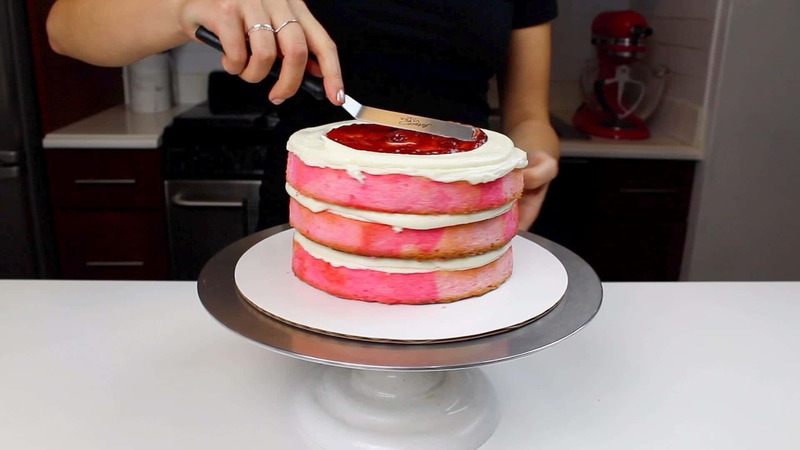 Hi chels, would amy filling work in general to add filling in between amy cake layer? Jam, preserves, or even make own filling? yup! As long as it’s thick enough not to bake out of them, any fruit base should work!